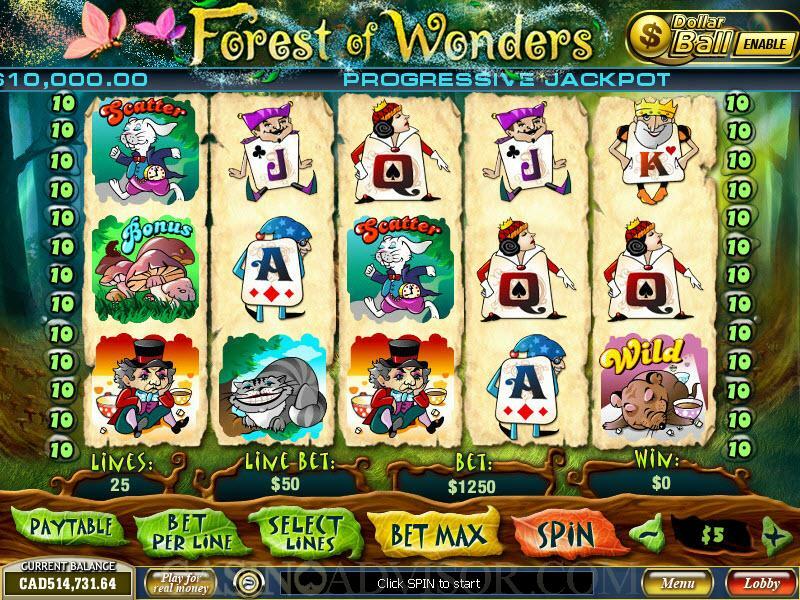 Forest of Wonders is an online slot game based on Alice in Wonderland. Fans of that eternal literary work will love this slot game simply because it brings to life their favorite characters doing their favorite things. The Dormouse is the wild symbol. Normally he lies unmoving on the table, but when in winning combination he starts to breathe heavily. The Toadstools are the bonus symbols. When they trigger the bonus round they disappear and start growing again. The White Rabbit is a scatter symbol. Always in a hurry he disappears from the reels. The other characters also exhibit suitable animation. The Caterpillar starts smoking his hookah. The hat of the Mad Hatter flies of. The best animation is that of the Cheshire Cat. Its body disappears leaving the behind a grinning face exactly replicating what it did in the story. The high-value cards are not represented by their symbols but by full card characters as in Alice in Wonderland. Alice however is conspicuous by her absence. 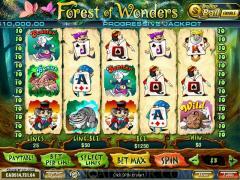 Forest of Wonders is a 5 reel and 25 payline slot game. Players can enable up to 25 paylines. Up to 10 coins can be wagered per payline. Each coin size can vary from 0.01 to 5.00. The Dormouse is the wild symbol. It offers the highest fixed jackpot of 5000 coins. The White Rabbit is the scatter symbol. Surprisingly it does not offer scatter payouts. 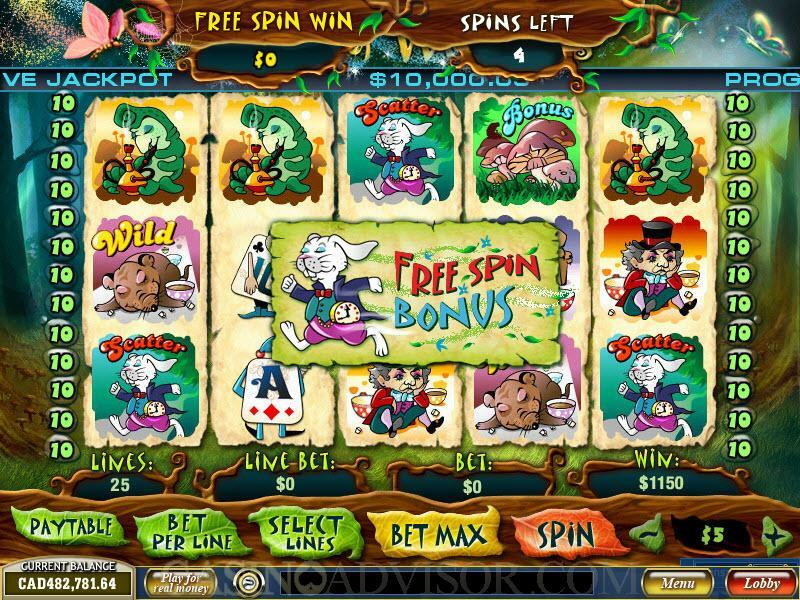 However if three or more White Rabbit symbols appear on the reels the free spins bonus round is activated. The number of free spins is determined in a unique way. 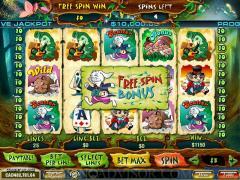 Players have to click on one of the White Rabbit symbols on the reels to reveal the number of free spins. The game also reveals what the players might have won had they clicked on another White Rabbit symbol. Additional free spins can be triggered in this round. The Toadstool is the bonus symbol. When three or more Toadstool symbols appear consecutively in an enabled payline the bonus game on the second screen is awarded. This is a very unusual kind of bonus game. Players are taken to a glade in the forest where there are 12 toadstools. Players have to choose three toadstools they think will give them the maximum bonus credits. When the credits are revealed, if the players are not satisfied they can discard this choice and choose another three toadstools. This process can be repeated till the final three toadstools are left, which players are compelled to accept. Forest of Wonders offers Playtech’s popular Dollar Ball progressive jackpot. The players have to place a separate wager for this by clicking on the Dollar Ball icon. Players choose five numbers from 1 to 49. Then as the reels spin the game draws five numbers. The players are separately paid out for this depending on how many of their chosen numbers match the drawn numbers. If all five match then the players hit the progressive jackpot. Interested in reading more detailed information about Forest of Wonders? If so Click Here for more details.